The grapes for the fine wines of Germany grow in vineyards located at the northern-most limit of their cultivability which is the predominant factor in the long growing season and the ability of German wine grapes to display such a wonderful balance of sugars and acidity. Germany's very best vineyards are situated on hillsides so steep and with what would normally be considered such poor quality soil that only vines can flourish there and viticulture is extremely laborious with any mechanisation totally ruled out. 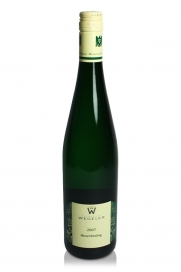 Traditionally the very best German wines were made from very late-harvested grapes with exceptionally high sugar content and when vinified the yeasts would die off at a maximum of 8% - 9% alcohol by volume. Such wines, although breathtakingly delicious, are not particularly food-friendly and since the 1980s the wine-drinking public's taste, which eschewed the mass-produced Blue Nun and Liebfraumilch commercial wines of the 1960s and 1970s, was more in line with a new trend in German wine-making for much drier ("trocken"), elegant wines which are much more suitable for the dinner table and a variety of foods and which are also vinified to higher levels of alcohol by volume. Most of Germany's wine production is white and the very best is made from the Riesling grape variety. The style of these wines is for no malo-lactic fermentation, no lees-stirring and certainly no oak-ageing resulting in white wines with a crystal-like clarity and great purity of fruit that can age very well. 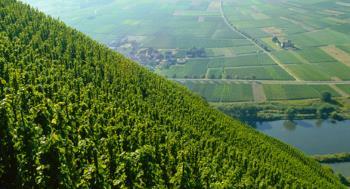 In the best vineyard sites of the Rheingau, Mosel, Pfalz and the Nahe it is planted almost exclusively. Müller-Thurgau and Silvaner vines are also widely grown but neither is capable of producing wines of the quality of the noble Riesling. In the last few decades, and probably influenced by the trend for warmer summer growing seasons, the proportion of red-wine grape varieties has increased to more than a third of the total vineyard area with the Spätburgunder (Pinot Noir) variety, which produces fine red German wines, having increased three-fold. The best of these wines are produced in the regions of Baden, Rheinhessen, Pfalz and Ahr the grapes benefitting from the longer growing season here. In fact Germany is now the third biggest producer of Pinot Noir in the world and, although very light in colour, these can be very elegant examples with a good balance of fruit (raspberry, redcurrant and strawberry) and acididity which match very well with ham and beef dishes. Dornfelder, a 1950s cross, also makes good, appetising red wine in the Pfalz region.